Have fun with a Hawaiian theme and wear a lei. 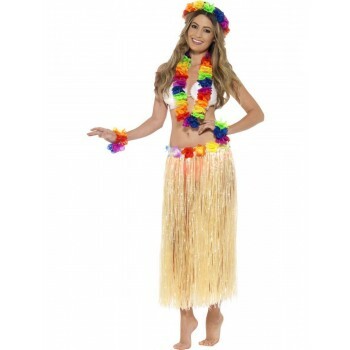 Fancy dress Hawaiian leis are perfect for any themed party. The moment you slip one of these over your head, you are instantly transformed into a party animal. Various styles of leis are available, allowing you to choose a colour scheme that works best to coordinate with the rest of your costume. Whether you pair it with a coconut bra, a Hawaiian shirt, or something else, you have the potential to be the life of the party. Fancy dress Hawaiian leis are a must if you are going to a costume party of any sort. If it's a tropical theme, then the easiest way to dress the part is with a floral necklace around your neck. It's simple, classy, and colourful!